For any individual residing in the Novi, MI area who is seeking to rent a party bus, then your search has now come to an end. Here at Rockstarz Limousine and Party Bus, we have the experience you are looking for that will ultimately make sure that your time with us far exceeds your expectations. When searching for a party bus in Novi, MI, there will clearly be a number of important things for you to take into consideration. Perhaps you are concerned about how many individuals can accompany you on the bus? Maybe you feel worried about the atmosphere? Well, there’s no need as our party bus is equipped with everything that you need to ultimately have an amazing time. Our Novi party bus service will result in you having what amounts to your own personal nightclub as you cruise around town. Not only is there ample space on board for you and your party, but at the same time we have included luxury leather seats just to give people the opportunity to have a rest when the party becomes too hard for them. In addition, our sound system will help you to blast out the music, and the laser light display can be used for some additional atmosphere to help get your party started. 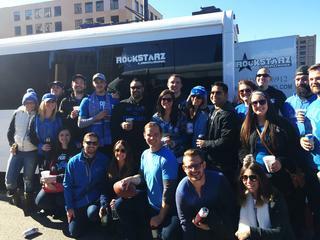 You can use our Novi party bus rental service for any celebration whether it be a special birthday, an anniversary of some kind, or perhaps you are going to be married and looking for that last party. No matter what the reason may be, you know that our party bus will be more than suitable as a location. So, any individual in the Novi, MI area who is seeking a party bus should give us a call at Rockstarz Limousine and Party Bus. Alternatively, you can go ahead and contact us via the reservation form on our website and someone will be in touch as soon as possible.